SmartGlass Technology offers construction contractors, engineers, architects and interior designers a completely new way to define spaces. 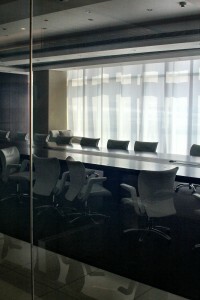 SmartGlass combines the functionality of an opaque wall with the style and lighting of clear glass. With glass being inherently thin, designers are turning ever more toward it to save space and inject style. This clever use of glass ties in with the prevailing trend of clean, minimalist styles in room design. Switchable SmartGlass is the ideal solution for creating a bright open space as it not only lets more light into the area but also gives the impression of increased space throughout the entire room. When SmartGlass is switched ‘on’ it looks like ordinary clear glass in an office boardroom, but when switched ‘off”, the smart glass will turn opaque immediately providing instant privacy for the meeting taking place. SmartGlass also acts as a high resolution rear projection screen ideal for boardroom presentations creating a greater sense of space and minimalist style. SmartGlass was recently installed at Microsoft’s HQ in Lisbon, Portugal. This entry was posted in Articles, Smart Glass News and tagged electric privacy glass, Electronically Switchable Glass, glass partitions, LC smartglass, Privacy Glass, SmartGlass International, switchable privacy glass. Bookmark the permalink. ← Latest Reviews of SmartGlass Guestrooms!